Italian deputy; born in Triest, Austria, July 5, 1860. Son of the Orientalist and archeologist Giuseppe Barzilai; studied law at the University of Bologna. 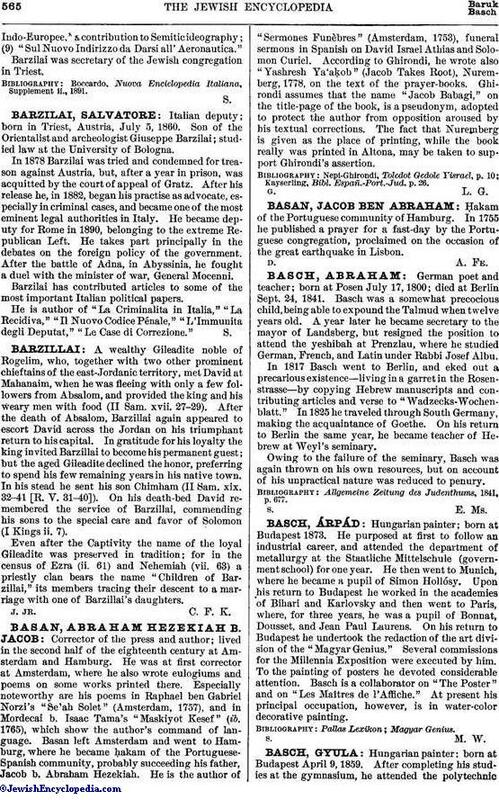 In 1878 Barzilai was tried and condemned for treason against Austria, but, after a year in prison, was acquitted by the court of appeal of Gratz. After his release he, in 1882, began his practise as advocate, especially in criminal cases, and became one of the most eminent legal authorities in Italy. He became deputy for Rome in 1890, belonging to the extreme Republican Left. He takes part principally in the debates on the foreign policy of the government. After the battle of Adna, in Abyssinia, he fought a duel with the minister of war, General Mocenni. Barzilai has contributed articles to some of the most important Italian political papers. He is author of "La Criminalita in Italia," "La Recidiva," "Il Nuovo Codice Pénale," "L'Immunita degli Deputat," "Le Case di Correzione."